"Escoffier" redirects here. For other people named Escoffier, see Escoffier (surname). Georges Auguste Escoffier (French: [ʒɔʁʒ ɔɡyst ɛskɔfje]; 28 October 1846 – 12 February 1935) was a French chef, restaurateur and culinary writer who popularized and updated traditional French cooking methods. Much of Escoffier's technique was based on that of Marie-Antoine Carême, one of the codifiers of French haute cuisine, but Escoffier's achievement was to simplify and modernize Carême's elaborate and ornate style. In particular, he codified the recipes for the five mother sauces. Referred to by the French press as roi des cuisiniers et cuisinier des rois ("king of chefs and chef of kings"—though this had also been previously said of Carême), Escoffier was France's preeminent chef in the early part of the 20th century. Alongside the recipes he recorded and invented, another of Escoffier's contributions to cooking was to elevate it to the status of a respected profession by introducing organized discipline to his guests. Escoffier published Le Guide Culinaire, which is still used as a major reference work, both in the form of a cookbook and a textbook on cooking. Escoffier's recipes, techniques and approaches to kitchen management remain highly influential today, and have been adopted by chefs and restaurants not only in France, but also throughout the world. Escoffier was born in the village Villeneuve-Loubet, today in Alpes-Maritimes, near Nice. The house where he was born is now the Musée de l'Art Culinaire, run by the Foundation Auguste Escoffier. At the age of thirteen, despite showing early promise as an artist, his father took him out of school to start an apprenticeship in the kitchen of his uncle's restaurant, Le Restaurant Français, in Nice. As an apprentice, August was bullied and swatted by his uncle and his small stature made him even more of a target–he was too short to safely open oven doors. Eventually he wore boots with built up heels. 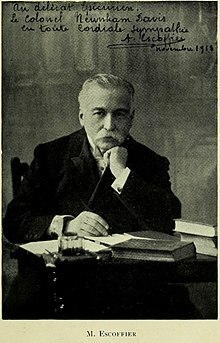 Escoffier showed such an aptitude for cooking and kitchen management that he was soon hired by the nearby Hôtel Bellevue, where the owner of a fashionable Paris restaurant, Le Petit Moulin Rouge, offered him the position of commis-rôtisseur (apprentice roast cook) in 1865 at the age of 19. However, only months after arriving in Paris, Escoffier was called to active military duty, where he was given the position of army chef. Escoffier spent nearly seven years in the army—at first stationed in various barracks throughout France (including five months in Villefranche-sur-Mer, coincidentally not three miles from his old home in Nice), and later at Metz as chef de cuisine of the Rhine Army after the outbreak of the Franco-Prussian War in 1870. His army experiences led him to study the technique of canning food. In 1884, the couple moved to Monte Carlo, where Escoffier was employed by César Ritz, manager of the new Grand Hotel, to take control of the kitchens. At that time, the French Riviera was a winter resort: during the summers, Escoffier ran the kitchens of the Grand Hôtel National in Lucerne, also managed by Ritz. Escoffier created many famous dishes at the Savoy. In 1893, he invented the pêche Melba in honour of the Australian singer Nellie Melba, and in 1897, Melba toast. Other Escoffier creations, famous in their time, were the bombe Néro (a flaming ice), fraises à la Sarah Bernhardt (strawberries with pineapple and Curaçao sorbet), baisers de Vierge (meringue with vanilla cream and crystallized white rose and violet petals) and suprêmes de volailles Jeannette (jellied chicken breasts with foie gras). He also created salad Réjane, after Gabrielle Réjane, and (although this is disputed) tournedos Rossini. On 8 March 1898, Ritz, Echenard and Escoffier were dismissed from the Savoy "for ... gross negligence and breaches of duty and mismanagement". Disturbances in the Savoy kitchens on that day reached the newspapers, with headlines such as "A Kitchen Revolt at The Savoy". The Star reported: "Three managers have been dismissed and 16 fiery French and Swiss cooks (some of them took their long knives and placed themselves in a position of defiance) have been bundled out by the aid of a strong force of Metropolitan police." The real details of the dispute did not emerge at first. Ritz and his colleagues even prepared to sue for wrongful dismissal. Eventually, they settled the case privately: on 3 January 1900, Ritz, Echenard and Escoffier "made signed confessions, admitting to actual criminal acts including fraud" but their confessions "were never used or made public". For example, wines and spirits to the value of £6,400 had been diverted in the first six months of 1897. Escoffier additionally confessed to taking gifts or bribes from the Savoy's suppliers worth up to 5% of the resulting purchases. Escoffier accepted an obligation to repay £8,000, but was allowed to settle his debt for £500. Ritz and Echenard paid a much higher sum. By that time[when? ], however, Ritz and his colleagues were on the way to commercial independence, having established the Ritz Hotel Development Company, for which Escoffier set up the kitchens and recruited the chefs, first at the Paris Ritz (1898), and then at the new Carlton Hotel in London (1899), which soon drew much of the high-society clientele away from the Savoy. In addition to the haute cuisine offered at luncheon and dinner, tea at the Ritz became a fashionable institution in Paris, and later in London, though it caused Escoffier real distress: "How can one eat jam, cakes and pastries, and enjoy a dinner – the king of meals – an hour or two later? How can one appreciate the food, the cooking or the wines?" One of his famous students was Akiyama Tokuzō Japanese imperial chef in the Ritz Hotel in Paris. In 1928, he helped create the World Association of Chefs Societies and became its first president. Escoffier died on 12 February 1935, at the age of 88, less than a week after his wife Delphine. ^ a b James, Kenneth (2006). Escoffier: The King of Chefs. A&C Black. ISBN 1-85285-526-6. ^ "AKIYAMA Tokuzo, Master Chef to the Emperor". National Diet Library, Japan. Retrieved 17 September 2016. Chastonay, Adalbert. Cesar Ritz: Life and Work (1997) ISBN 3-907816-60-9. Escoffier, Georges-Auguste. Memories of My Life (1997) ISBN 0-442-02396-0. Shaw, Timothy. The World of Escoffier. (1994) ISBN 0-86565-956-7. This page was last edited on 27 January 2019, at 16:15 (UTC).